Happy Thursday! 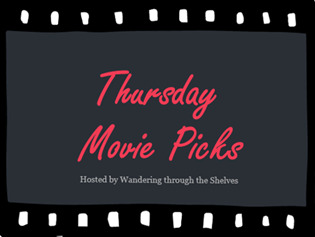 This week on Wandering through the Shelves' Thursday Movie Picks, it's Train Movies. Cool topic! Hard to narrow down. I can only think of maybe two movies (that I've seen) that are set entirely on trains. I have seen plenty of movies with scenes on trains. I think I'm more intrigued by the image of the train, and its vitality to the history of cinema proper. I mean, the very first movie that people talk about is The Lumiere Brothers 1894, one-minute extravaganza aptly titled, Arrival of a Train at La Ciotat. It's as if every movie featuring a train can be tied to this one little film at the dawn of the motion picture camera. Movie cameras shooting trains, man. That's what it's all about. My picks today are all about my favorite train moments. My first two picks I saw on the same November evening in 2007. Both feature trains prominently. Both, in fact, open with trains (see clips). One departing, one arriving. Both films were on my list of the best films of 2007. The opening sequence of Wes Anderson's The Darjeeling Limited is one of my favorites from all of his films. Bill Murray as Business Man races Peter Whitman (Adrien Brody) to an already departed train. Kinks on the soundtrack. Slo-mo. Cool. To this day, I have never seen a more beautifully shot film. It all starts with the awesomeness of the Blue Cut Train Robbery orchestrated by the James Gang in the late 1880s. Roger Deakins' work here is the stuff of legend. His work with director Andrew Dominik in crafting this scene is just so far above anything I've ever seen on film. And I am so grateful to have gotten to see this masterpiece of a box office disaster on the big screen. The train wreck sequence in J.J. Abrams' homage to Spielberg (which Spielberg co-produced) is in itself the reason we go to the movies. It is one of the most magically cinematic scenes, for me, in recent years. It's a movie about kids who make movies, and it happens to gain most of its momentum, as far as plot is concerned, from this one moment. Oooh great picks, and I haven't seen any of these! I've heard of Super 8 though, and I've been meaning to watch that one for ages now. Yes. Watch Super 8. It is wonderful. Nice picks! I've never seen Assassination of Jesse James. I know I should. I also chose Darjeeling and I love that scene in Super 8, that's a worthy one as well. Thanks! So watch it. It is so gorgeous. It's a slow movie that I don't mind being slow. Darjeeling Limited is the one Wes Anderson film so far that I haven't liked. I've seen scenes from Assassination of Jesse James and DAMN is it gorgeously shot. Can't wait to see the whole thing. I really liked the first half or so of Super 8, but it fell off pretty steep for me. My favorite thing about Arrival of a Train... is that the original audience got scared because they thought the train was actually going to come crashing through the movie screen (something Scorsese played with in his silent homage Hugo). OH how far we've come! I love Darjeeling Limited. It seems to be his most divisive work. Assassination of Jesse James is unreal gorgeous. Watch it. I can agree a bit on Super 8. I remember wishing it had just been about these kids making a movie. The alien action stuff was not exactly necessary. Yeah. I noticed the parallels in Hugo as well. That little train movie really started it all. Darjeeling is everywhere today. Good movie so I'm not complaining. Glad someone picked Super 8. I really enjoyed that, too. Been meaning to see that Jesse James flick for years. Just never got to it. Thanks for reminding me. It's one of the better train movies I've seen, as far as being completely set on a train, well, for the most part. Super 8 is wonderful. Those kids are all so great. See THAT Jesse James flick. It is astoundingly beautiful. Love that you started with Arrival of a Train! That's a perfect beginning. I can't believe you came up with three I haven't seen, one of which, Super 8, that somehow completely blew by me before now. That actually sounds like the one I'd find most interesting, thanks! I've avoided Darjeeling since I'm a not a fan of either Owen Wilson nor Jason Schwartzman but I do love Anjelica Huston so I'll probably give it a go sometime. My sister saw Jesse James in the theatres and said that it was beautiful to look at but it was sooooo slow and I've put off seeing it because of that even though I like the entire cast. I usually try and pick movies that I've loved but this week the first one I picked specifically because it stinks and shows the real dangers of remaking a classic that was done right the first time. Love my others though. The Lady Vanishes (1979)-An example of all that can go wrong when a classic is inadvisably remade. Peter Bogdanovich recasts the roles so expertly done by Margaret Lockwood and Robert Donat in the Hitchcock original with the totally unsuitable Cybill Shepard and Elliott Gould and proceeds to get everything else wrong that the first did right. The one bright spot-Angela Lansbury taking over the role of Miss Froy that Margaret Rutherford played in the original but she’s in too little of the movie to save it. Murder on the Orient Express (1974)-The gold standard for mystery adaptations. Superior version of Agatha Christie’s novel of a snowbound train on which a murder has occurred and which the famous detective Hercule Poirot sets out to solve. Everything is top of the line from the set and costume design to the cast. What a cast! In every role is a recognizable face from either American or international cinema. Everyone does terrific work though Ingrid Bergman’s best supporting actress Oscar is puzzling, even she didn’t think she deserved to win. Betty Bacall is a real standout as the loquacious Mrs. Hubbard and Albert Finney gives a tremendous performance of the fussy Belgian sleuth. Lady on a Train (1945)-A lady on a train, Deanna Durbin, witnesses a murder from her window but can only identify the victim not the killer. She goes to the police but when they don’t believe her story she turns to a writer of detective stories for help and together they try to find the killer and solve the case. Light mystery spoof even finds ways to have Deanna sing a few songs, backed up by a great supporting cast including Edward Everett Horton, Dan Duryea, Elizabeth Patterson, George Coulouris, Ralph Bellamy and William Frawley she has rarely looked so beautiful. Honorable Mention-Unstoppable (2010)-Because of a stupid mistake a train containing dangerous material has become a runaway. A mismatched pair of train engineers on their first day as partners try and stop it before disaster strikes. Fast paced and exciting with some cool derring-do but nothing that pushes the movie over into ridiculousness. Denzel Washington and Chris Pine make a solid team. Glad I could offer a recommendation or two. Humbling considering your wealth of movie experiences. Super 8 is a super fun watch with great performances from its young cast. It devolves a bit too much into an action extravaganza but is so worth watching anyway. I love Schwartzman and Wilson and anything Wes Anderson, so it works for me. Warning: Huston is only in a few minutes of the film. I love her work there though. Jesse James should be seen simply for its mastery of tone, cinematography, and its lovely score by Nick Cave and Warren Ellis. It is just plain not too slow. It is exactly what it's supposed to be, in my opinion. See it. It's funny. I just listened to Peter Bogdanovich on Marc Maron's WTF podcast. A great listen. He expressed his lifelong, undying love of Cybill Shepard, so that would explain that casting. And that's a guy with several great loves. I so need to see your other picks. Unstoppable is one I really hate that I missed in theaters with it being Tony Scott's last movie. Scott is actually an underrated director in my opinion. He made some great action pictures. And seemed to have a thing for trains with his last two films. Nice to see that pick. The only issue I have with The Assassination of Jesse James by the Coward Robert Ford is why is Robert Ford considered a coward for shooting Jesse James in the back whilst Jesse James, who also shot someone in the back (if my memory serves me correctly) not branded as a coward? I did like the film, however. Yeah. But Jesse James and his stories were legend, and he was incredibly famous and beloved. That is what branded Ford a coward. I have seen The Assassination...but it just didn't grab me and felt very slow moving. I do want to see Darjeeling Limited and have been reminded about that film on another blog. Super 8 actually looks good! Is that Elle Fanning?? I like the slow pace of Jesse James. It gave me time to admire its gorgeousness. Darjeeling is a lot of fun actually. I dig it. And yes, that is Elle Fanning. She is great in Super 8. See it. Not seen Super 8, but I do love Darjeeling Limited, I have a feeling this willl pop up quite a bit in some lists. Ah Jesse James, good film but oh my it is long. Super 8 is really a good one. Check it out. Nice tribute to the sensibilities of young Spielberg. Darjeeling is just go-to here, at least for me. Jesse James is long but so perfect. I never minded its length or its pace and am so grateful to have had the opportunity to see it at the cinema. The Darjeeling Limited has been quite popular this week. Oh I like that you included the one from Super 8, I haven't seen that on others' list but yeah, it's definitely a memorable scene. Because it's so good. And it loves trains. Thanks on Super 8. I love that scene. It is pure movie. Great picks! I liked Super 8, and went with Darjeeling Limited for this week too. I have yet to watch The Assassination of Jesse James. That's all you can do, man. It's only a minute long. The YouTube clip is the whole film.